A smash attack is a special technique used by every character in all Super Smash Bros. games. There are three types of smash attacks: forward smashes, up smashes, and down smashes. When the player tilts the Control Stick very quickly and presses the A Button at the same time, they will use a very powerful attack that can cause massive damage to their opponents, and usually launches them. Starting in Super Smash Bros. Melee onwards, if the player holds the A Button, they will charge up the attack, making the smash attack even more powerful. In Super Smash Bros. Brawl, there is an option to do a "Shake Smash" with the Wii Remote and Nunchuk, which by shaking the Wii Remote, the character will perform a quick, uncharged smash attack on an opponent. The damage multiplier of charged smash attacks in Super Smash Melee is 1.3761x the regular damage; from Super Smash Bros. Brawl onwards, the multiplier is 1.4x. Some characters have the ability to angle their forward smashes upwards and downwards. In Super Smash Bros. Brawl, due to the four types of controller options, some controllers won't support the same control method used in the last two games, but rather, use a different control method. 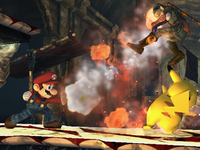 Also, in Super Smash Bros Brawl, some enemies can use smash attacks too. In Super Smash Bros. Ultimate, smash attacks can be charged 3x longer than in previous games; while damage increases until a certain cap, knockback increases until the end of the smash attack's charging duration. This page was last edited on March 20, 2019, at 19:16.